People get the first impression of you through the looks on your face. Your personality is highly dependent on the looks on your face. A sagging skin will obviously lower your personality as a person. As one ages, the collagen and elastin structures of the skin lose their elasticity making the skin sag. Other factors which can lead to sagging skin include exposure to harmful rays of the sun, consumption of excessive alcohol, pregnancy, smoking, dehydration, and poor diets, wrong skin care products and even weight loss. Apart from sagging, one may notice wrinkles and fine lines along the face. 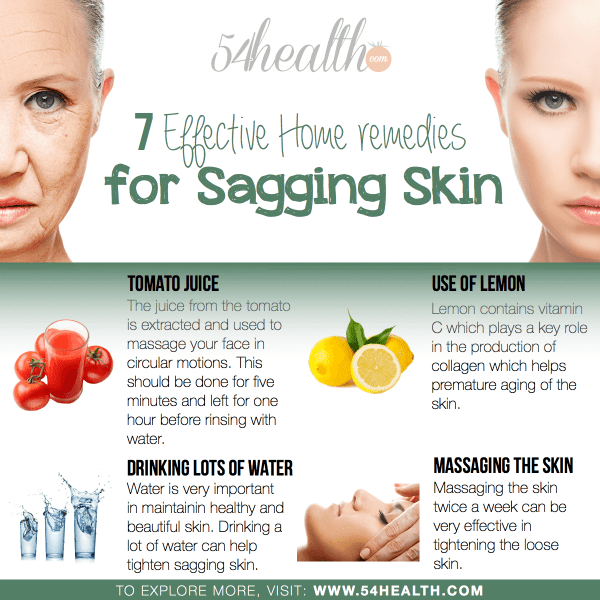 However, there are simple home remedies for sagging skin that can bring out the lost beauty. Water is very important in maintaining healthy and beautiful skin. Drinking a lot of water can help tighten sagging skin. As we have seen earlier, dehydration is among the causes of skin sagging. However, drinking plenty of water can restore the skin back making remain intact. The skin cells will receive plenty of water and become elastic pulling the skin together. Apart from tightening the skin, water washes away toxins that accumulate under the skin making it to age early. Premature aging usually makes the skin sag and if you can drink plenty of water, most toxins found within the skin can be removed together with the water. Water supplies moisture to all parts of the skin making the skin remains smooth all day. One should ensure to take at least 8 glasses of water daily. Exercises are very important in stretching the skin and increasing its elasticity. When people exercise, they sweat a lot which helps detoxify the skin. Sweat usually comes with toxins that accumulate under the skin preventing premature aging of the skin. Exercising also increases the body’s muscle mass making the skin to tighten further. This does not mean you have to go to the gym daily to tighten up your skin. Cardiovascular exercises that make you lose a lot of calories are not ideal for tightening up sagging skin. Involve in light exercises that help you stretch and sweat at the same time. This can be done in the morning before you take your shower or later in the evening after work. Apart from tightening your skin, exercises are very important in keeping your body fit. Egg whites are usually a natural stringent and play a key role as a natural remedy for sagging skin. It usually nourishes the skin with its hydro lipid ingredients that help tighten loose skin. Application of white eggs is very simple. Whisk two eggs in some glass until you get a foamy mixture and then apply it on your neck and face surface. This should be left for about 20 to 30 minutes before rinsing with cool water. Yogurt can also be used to make the white eggs. A table spoon of yogurt is usually added to the white eggs and whisked before been applied for 20 to 30 minutes. This should be done twice a week for some month and the loose skin will slowly start to tighten up and look radiant once more. Massaging the skin twice a week can be very effective in tightening the loose skin. Oils like olive and mustard are recommended for efficient results. One can opt and make massaging a habit which should be done daily. When the skin is massaged on a regular basis, it becomes more elastic and pliable making the skin structures come together. The fresh lemon juice is usually extracted and rubbed over the face gently. This is then left for 10 minutes before rinsing with plenty of water. The process should be repeated 3 times a day and followed up with the application of a moisturizer. Fresh juice can also be added to some water and splashed on the washed face. The lemon should be left to air dry so that the lemon ingredients can be absorbed into the skin. This process should be done twice on a daily basis and expected results will be observed after some weeks. Green tea is known for its numerous medical benefits for several years. This is one very health beverage among the health conscious people. It is very rich in antioxidants which are known to play a key role in the maintenance of a healthy skin. Green tea purifies blood and cleanses the body from within helping remove any toxins which can accumulate within the skin. Synthesis of collagen is also greatly improved thorough increased consumption of green tea. We have already seen how important collagen is in tightening loose skin. It helps reduce the bagginess of your skin leaving one looking beautiful. It is advised to sip a cup of green tea on a daily basis to get the expected results. The juice from the tomato is extracted and used to massage your face in circular motions. This should be done for five minutes and left for one hour before rinsing with water. However, one should expect the tomato juice to sting for a while as they contain some acids. This should not deter you as they are very effective in tighten the loose skin. This process should be done once in a day for individuals to get a tight and bright skin. The skin is the largest organ in human body and great care should be taken to prevent it from sagging. It is essential that people recognize the importance of using natural remedies to chemicals which may further harm the skin. Patience is also important in achieving expected results. One should not expect to get the expected results immediately but with continued use of the natural remedies, the skin will tighten with time bringing the beautiful old looks back. Check out other home remedies here.